Martin Boyd’s book The Cardboard Crown is an important title within the Text Classics list. I first read it in the late 1970s as a Year 11 student, having been assigned Boyd’s A Difficult Young Man as an English novel. It was a courageous selection by my teacher in a world where the canon ruled supreme for the HSC. It struck this precocious teenager that this Martin Boyd Australian voice was startlingly different to the diet of Lawson and Paterson that had been inflicted on us up to that point. Teenage literary criticism 101. At that stage (the 1970s) the four books in The Langton Quartet (The Cardboard Crown, A Difficult Young Man, Outbreak of Love, When Blackbirds Sing) had been republished by Lansdowne – their first Australian iteration, as all of Boyd’s novels had previously only been published in England. The fact that Text has decided that Boyd’s work is classic Australian literature is ironic in the sense that Boyd spent most of his life away from Australia, returning only briefly after both wars. So we have to place Boyd in the great Australian expatriate literary tradition – think George Johnston, Germaine Greer and Clive James. The plot of the book is simple. The narrator turns up postwar in the family home outside Melbourne and discovers his grandmother’s diaries which reveal a variety of skeletons which then provide the bones for the tetralogy, covering the story of the succeeding generations up to Boyd’s present (the 1950s). There is an argument that the four novels – in their coverage of an extended period of time and passing of generations – are as close as we have to an antipodean version of English series such as John Galsworthy’s The Forsyte Saga or Anthony Powell’s A Dance to the Music of Time. For historians, Boyd provides a unique perspective on the years between the Gold Rush and World War I. Too often our default setting is rural and outback (Russel Ward’s The Australian Legend, Mary Durack’s Kings in Grass Castles). Boyd’s world, on the other hand, is set delightfully in suburban Melbourne, a world of middle-class families, the odd remittance man and a class consciousness that is perhaps best captured in the following passage. Except for Arthur’s brother Walter who became a High Court Judge, they were our most prominent, wealthy and successful relatives. Hetty, never forgetting that she was the daughter of a dean, sent two of them into the Church. One became Bishop of Yackandandah, and the other an archdeacon. Her third son made a fortune on the Stock Exchange and had a fashionable wife and a mansion in Toorak. Class plays a key role in the characters’ actions and conversations. However, the most striking feature of the Langtons’ story is the continual plans to go ‘home’, that is, to England. It is not unsurprising that large sections of the novel take place aboard ship; in fact, the key moment of the novel is a shipboard liaison which becomes the catalyst for the plot. The Langtons are tied to an English house, ‘Waterpark’, and the time spent there is much more Jane Austen than Henry Lawson. The novel’s journeys reflect the reality of the ties to England at that time and the Langtons’ peripatetic nature tells us much about how the middle classes of the time were ambiguous in their feelings towards their lives on the other side of the world. This runs counter-intuitive to the Barcaldine Tree of Knowledge narrative in our history. There are no shearers’ strikes or Harvester Judgments in Boyd, simply middle-class people not quite knowing where they belong – if you like, a middle class whose Australian identity is at best ambiguous at the moments we like to think are the formative years of our nation. There are in the country outside Melbourne little cottages built of bark and tine [a pointed branch], whitewashed, with vines along their walls, and the fowls pecking at the hard earth under the fig tree, where one feels the disguised Ulysses might have asked for shelter and a bowl of goat’s milk, while one cannot possibly imagine him calling at Waterpark, with its far greater antiquity. But this may be partly due to that feeling one has in the Australian countryside, that it has known the morning of the world. If you read that passage carefully, Boyd is clumsily making a connection between the world of antiquity and pre-European Australia – writing in 1952, on the other side of the world about a country he had to leave; Homer and the Dreamtime no less, no more, decades before the idea of an Aboriginal history or archaeology even existed in a white world. So, while the writing is remarkable, there is a strange disconnect between the writer and his landscape. In a sense, my point is that the novel is important because it reflects a moment in the Australian aesthetic. 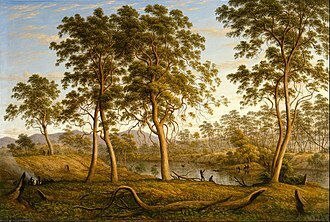 If it were a painting it might be a John Glover, with the gum trees just slightly wrong. It is wonderful Australian writing, but it is writing that is not home-grown and for that reason slightly misses the mark. 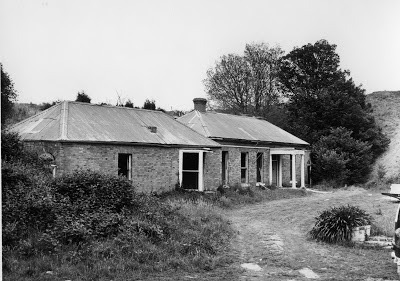 In a contemporary review of the novel in the Melbourne Argus Geoffrey Hutton wrote: ‘One burden the Australian novelist labors under is an acute social conscience and a determination to be as Australian as a weatherboard shack or a country cowshed’. That is an incredibly perceptive comment. If we are looking back past the Great War our literary heritage tends to be ‘The drover’s wife’ or My Brilliant Career. If you add Anzackery to that history there is little room for the ambiguities and complexities that Boyd explores in the novel. The Bush and Anzac cover the field. Hutton goes on to praise the novel, however, you get the sense that he knows it’s a lost cause. Boyd never really caught on in Australia because what he was writing about missed the changes in the way we thought of ourselves after the two wars. The Langton Quartet is an important part of Australian literary history for documenting a past that can easily be forgotten. A past that was uncomfortable with an English sensibility gradually fading away in the glare of the Australian sun. As you read The Cardboard Crown, you get the sense that, with each boat journey the Langtons take back to England, the less confident they are of finding home. Three cool facts to note. Martin Boyd was living in Australia when World War I broke out. Perhaps unfortunately, he chose to travel to England before enlisting in an English Regiment. It is one of those wonderful what ifs: what if Martin had been an Anzac? Would he have written about Australia differently? Secondly, another Boyd is represented in the Text Classics list, Robin Boyd’s The Australian Ugliness. Like his uncle, Robin cast a critical eye on the Australian landscape – the built one. Thirdly, The Cardboard Crown has a small passage where the narrator’s nephew Julian comes to the house to paint. It is a fictionalised account of Arthur Boyd’s beginning as an artist. Martin’s ‘patronage’ was welcome to the young painter – who, unlike his uncle, managed to get the Australian landscape right. * John Shield is a secondary history teacher in Gladstone, Queensland. He has written for Honest History about Text Classic’s All the Green Year, by Don Charlwood, and Between Sky and Sea, by Herz Bergner, and on the treatment of Indigenous children in institutions, how to teach and commemorate Anzac, a review of a biography of Chester Wilmot, Top End Anzackery, a review of the edited diaries of William Baker Ashton, and a review of Leigh Straw’s book on the aftermath of the Great War in Western Australia. All four books are now Text Classics. ‘Anzackery’: ‘the use and promotion of the Anzac legend, especially in ways seen to be excessive or misguided’ (Australian National Dictionary). For lots more on Anzackery, use our Honest History Search engine.